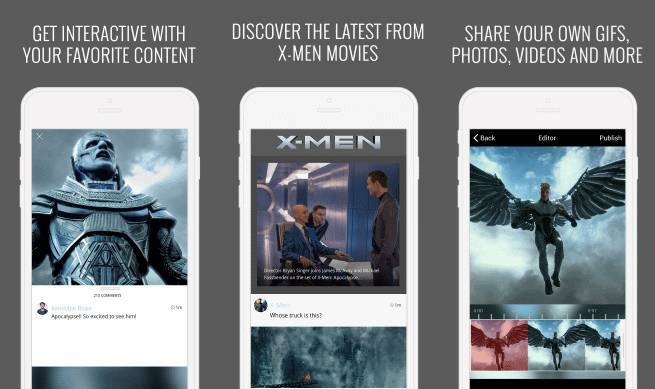 20th Century Fox has launched the “X-Men Movies App.” Powered by the Victorious platform, the app is designed to bring fans of Fox’s X-Men film franchise together in a place where they can share their fan made creations. The app is available free for download via Apple’s App Store and the Google Play store. Submissions (March 22 - April 26): Upload a video into the app showing what “My mutant power is...” with the hashtag: #XMenContest. The clip can be epic, funny, heartwarming, etc.--as long as it’s uniquely you. Finalist Selection (April 27 – May 2): The 100 community mutants that garner the most in-app followers between March 22 – April 26 are finalists and all win exclusive giveaways like character posters, apparel, and more. Finalists will be notified through the app’s 1:1 messaging. Winners Announcement (May 3 – May 6 ): The five top community mutants (chosen according to the number of followers earned within the app), will each win the grand prize of an early fan screening of X-Men: Apocalypse for them and their friends, exclusive giveaways, and featuring of their work in the app community and across social media. The release of the new app is part of the lead up to X-Men: Apocalypse, the next installment of the Fox film franchise. Since the dawn of civilization, he was worshiped as a god. Apocalypse, the first and most powerful mutant from Marvel’s X-Men universe, amassed the powers of many other mutants, becoming immortal and invincible. Upon awakening after thousands of years, he is disillusioned with the world as he finds it and recruits a team of powerful mutants, including a disheartened Magneto (Michael Fassbender), to cleanse mankind and create a new world order, over which he will reign. As the fate of the Earth hangs in the balance, Raven (Jennifer Lawrence) with the help of Professor X (James McAvoy) must lead a team of young X-Men to stop their greatest nemesis and save mankind from complete destruction. Check out when this movie and other movies are coming out in ComicBook.com's Movie Release Schedule.